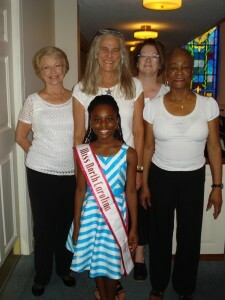 2015 Miss North Carolina Pre-Teen Jessica Johnson attended the Charleston Symphony Orchestra Gospel Choir, honoring those killed at Mother Emanuel Church. 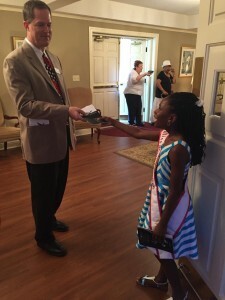 2015 Miss North Carolina Pre-Teen Jessica Johnson attended the Charleston Symphony Orchestra Gospel Choir and Spiritual’s performance of the special concert honoring the nine people killed at the Mother Emanuel Church in Charleston, SC. 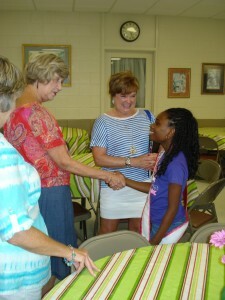 Jessica was instrumental in helping serve lunches to the volunteer choir and musicians prior to the concert. They served about 120 people and Jessica performed duties that involved food service and clean up with her friendly, sweet smile and ease of discussing different topics with our performers. At the appointed time, Jessica stood at the front door with the head usher, welcoming attendees to this very special and somber concert. Her presence and smiles provided such special qualities to those entering the church: hope for the future, welcoming as only a child can do with innocence and love. Jessica added such a specialness to this concert. Jessica performed these tasks with ease and comfort and great poise. She took direction well, understanding immediately what was being asked of her. Choir members, musicians and those attending the concert, were so taken with her. Jessica provided some salve to the wounds of the people of Charleston, something she didn’t even realize she did. The Choir was very grateful to this beautiful young lady and wish her great success in her future endeavors. Author Matt LevertonPosted on January 24, 2016 Categories Community Service, Former Queen, north carolina, pictures, Pre-Teen, RoyaltyTags 2015, at, attends, carolina, Charleston, Choir, church, Emanuel, honoring, jessica, johnson, killed, Mother, nam, namiss, north, Orchestra, pageant, pageants, pre, Symphony, teen, the, thoseLeave a comment on 2015 Miss North Carolina Pre-Teen Jessica Johnson attended the Charleston Symphony Orchestra Gospel Choir, honoring those killed at Mother Emanuel Church.